When used in K-12 classrooms, intelligent tutoring systems (ITSs) can be highly effective in helping students learn. However, they might be even more effective if designed to work together with human teachers, to amplify their abilities and leverage their complementary strengths. In the present work, we designed a wearable, real-time teacher awareness tool: mixed-reality smart glasses that tune teachers in to the rich analytics generated by ITSs, alerting them to situations the ITS may be ill-suited to handle. A 3-condition experiment with 286 middle school students, across 18 classrooms and 8 teachers, found that presenting teachers with real-time analytics about student learning, metacognition, and behavior had a positive impact on student learning, compared with both business-as-usual and classroom monitoring support without advanced analytics. Our findings suggest that real-time teacher analytics can help to narrow the gap in learning outcomes across students of varying prior ability. This is the first experimental study showing that real-time teacher analytics can enhance student learning. 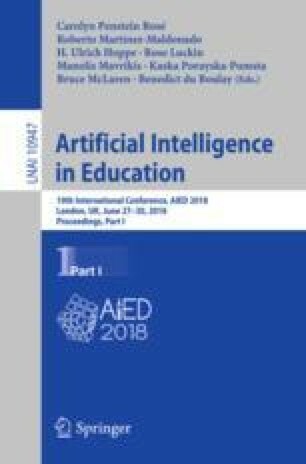 This research illustrates the promise of AIED systems that integrate human and machine intelligence to support student learning. This work was supported by NSF Award #1530726, and IES Grant R305B150008 to CMU. The opinions expressed are those of the authors and do not represent the views of NSF, IES or the U.S. ED. Special thanks to Gena Hong, Octav Popescu, Jonathan Sewall, Mera Tegene, Cindy Tipper, and all participating students and teachers.